I think nature is a whole lot more patient than I am! I’ve been sort of wrestling with one of my writing projects. It’s a different type of writing than I normally do, and it doesn’t flow as easily to me. It is coming together, yes. But not effortlessly. Every word, every paragraph, I am hammering out and refining, over and over again. It’s a very “Eight of Pentacles” process. Work a little. Refine a little. Work a little more. Refine a little more. Hammer, hammer, hammer. Polish, polish, polish. I’m not complaining, mind you. Just noting. I know it’s good to stretch outside your comfort zone. I had been feeling a little self-conscious about it. Bothered enough that I have drawn cards on the issue. They told me exactly the same thing we’re getting for the message this week. Go figure! Next Week: Hammer it Out, Baby! 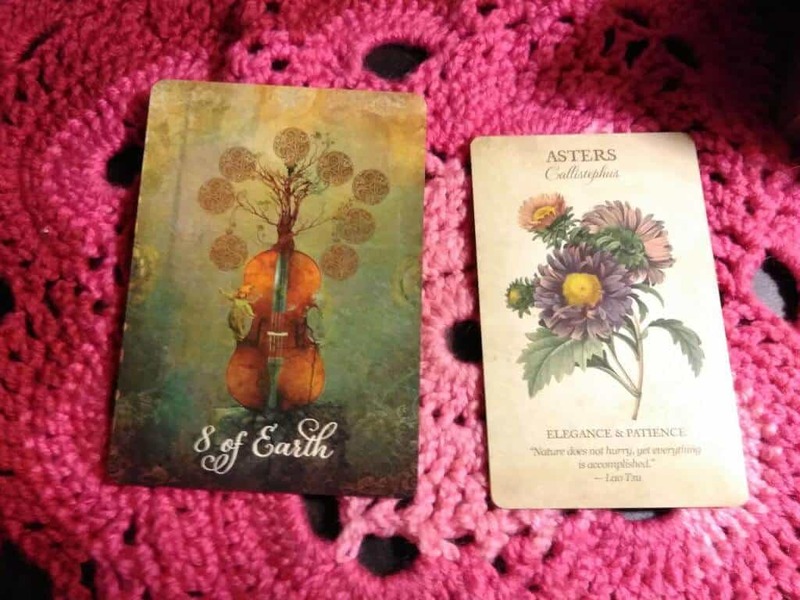 This week, we’ve got the Eight of Pentacles (or 8 of Earth) from the Good Tarot and Asters–Elegance & Patience–from the Botanical Inspirations deck. These two messages are perfectly harmonious. You don’t reach the height of accomplishment in a fell swoop. You do so one step at a time. This is true whether we’re talking about writing an article, learning a skill, building a relationship or changing the world. One. Step. At. A. Time. That’s it. This week, do not bemoan all the steps not completed, be they your own or another’s. Just keep moving forward, incrementally. That’s really all that’s required and frankly, it’s also all that’s possible. So it may be wise to appreciate the view along the way instead of complaining about the view you don’t yet have. Of course, I always think that’s wise. You hammering it out, too? If you need a little help figuring it all out, give me a holler for a one-on-one. Armchair astrology notes: Mercury is retrograde so double-check communications and if you don’t already know we’ve got an eclipse coming, there isn’t much I can do for you! Make allowances for the edginess so many are feeling and be kind to yourselves out there! The reversed Eight of Pentacles says, “That’s not your job.” You don’t have to work it all out. Or come up with an answer for all the questions. Or solve all the problems. Or know all the facts. It’s not your personal job to sand off the rough edges of THE world–or even YOUR world. When you hitch your sense of well-being onto conditions outside yourself, you’re utterly screwed. Always! Oh sure, it could seem like you’ve got it under your control for a minute, but we both know that’s illusion. There is no way to keep ahead of the permutations of behavioral possibilities that are other people! Cannot be done. I don’t always keep up with my own brain, for Godssakes! But luckily, there is no need. FEEL your way through. Options are always lit up for you , but you cannot see them if you’re not vibrating somewhere in that neighborhood. So your job is to get in that neighborhood. You do that by comforting and soothing yourself. You reach for your center and there it is! Freedom, security or happiness are not gifts from the Universe that some are blessed with while others cruelly denied. Because these words describe internal states, not external. Of course, we are impacted by others but it’s up to us what we do with that. How low long we remain soaked in whatever energy, and how big and fast that energy grows? That’s up to us, set by what energy we feed. Riding a bike, you don’t say to the bike, “You, Bicycle, must always adjust yourself to keep me in balance. Good bikes stay upright!” And if you expect that, you’ll be forever disappointed. Instead, you expect to maintain your own balance and constantly correct, for when you’re leaning too far one way or another. It may be the road you’re traveling that introduces the lean, but you take it upon yourself to keep your center of gravity intact. And as you relax into the ride, it gets easier and easier keep your balance and stay on center. Keep practicing! So right now, look to do what you do. Be true to yourself. Don’t worry about what’s been or what’s coming. Just be here, now. Fully present. Be here for yourself alone and as you do, you’ll be able to bless the others by your clarity and and the inspiration you can only access when you are clear and connected. It really is the only way to be a part of improvement, anyway. But don’t do it with an ulterior motive, because that mucks things up. Just do it for you. And really? That’s enough. It’s better than enough! This week’s Tarot features the Radiant Rider Waite deck. Hit Dix up for a personal session.